I've been watching reruns of The Newsroom the last few weeks. (It's one of my favourite shows -- Aaron Sorkin is simply brilliant!) One of the episodes I was watching made me think about conflict styles: Maggie and her boyfriend have broken up over a dozen times. In episode five, her colleague Jim advises her to "stop breaking up and 'learn' how to fight." Sometimes being happy together is not just about being happy; it is about learning to deal with each other when you're not happy. How you respond to conflict is key. Most of us want to avoid conflict. We try to smooth things over when disagreements erupt and to live in a state of harmony rather than dissent. But we also recognize that standing up for yourself or what you believe in is sometimes necessary and the right thing to do. That said, anger rarely ever brings out the best in us. When we feel our blood boiling, we often regress to a state that's childlike, emotional and even tantrum-y. This is especially true when we're hurt. Then, we may lash out with the sole purpose of hurting somebody back. What's more, conflicts are further complicated by the fact we don't all handle conflict the same way. This is a fact that can end up exacerbating situations where conflict arises. 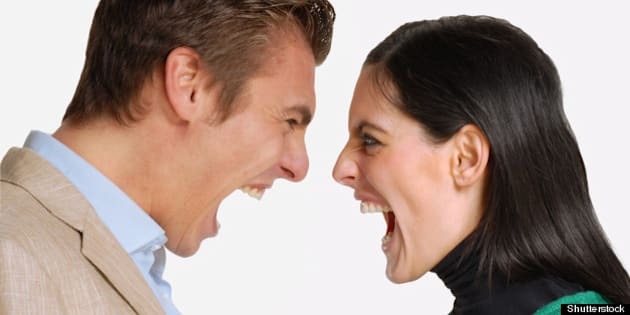 When we confront a different conflict style, we can feel a gamut of reactions; that people don't care as much as we do, or that their approach to conflict is intimidating. We can also begin to question our own reactions, wondering if we're overreacting or unjustified in what we're feeling. I'm a big advocate of trusting your own reactions. If something or somebody hurts or angers you, those are YOUR feelings to acknowledge and work through -- not something you need legitimized by another. That said, if you're wondering why others don't seem to react the same way (or care as much! ), it's worth remembering that there are different ways of expressing the same feelings. This is helpful not only when seeking to understand those around you, but also so you can learn something about yourself too. Scrappers love a good fight and can sometimes be perceived as aggressors, in business and other relationships. The positive thing about a scrapper is that they won't hold back from a conflict; if something needs to be asserted boldly, these are people who will take on that challenge. The less positive side is that they might be a little too ready to take on a fight, even when it's not entirely necessary. If you tend to have a scrappy personality, try to take a deep breath before you wade into conflict, especially if you're under a lot of stress. Think about the outcome you're looking for and then evaluate the best way to achieve that outcome. Your passion and willingness to speak up is not in itself character flaw, but it's also worth developing some alternative ways of dealing with conflict. Diplomacy often sounds like the perfect conflict style to have. Those who are diplomatic are able to see the bigger picture, look at an argument from both sides and find ways of reconciling. This is indeed a noble approach to conflict, one that keeps messy emotions contained and relies on reason over feeling. The downside of being a diplomat is that you can sometimes feel like you're the only one making that effort. Because diplomats lead with reason and seek reconciliation, they often don't express their own hurt feelings. And an impassioned scrapper can often feel like a diplomat's rational approach is uncaring or cold. If you're a diplomat, try to see the emotional side of an argument as well as the rational side... and don't forget to express your own feelings too. People-pleasers not only seek to avoid conflict but also to diffuse any dissent at all. They may tell you that an outfit looks great on you when they don't really believe it, just as a way of avoiding conflict. Or, they'll say something you do is okay when they're secretly upset. In this way, it can be difficult to engage with a people-pleaser because they often deny or suppress their own true feelings. This approach is certainly a pragmatic way of dealing with minor frustrations that aren't worth expending energy over, but in an intimate friendship or relationship, it can build resentment. The people-pleaser may feel trapped by their own way of doing things and hoard anger about a lot of small issues, so that they don't know where to begin articulating their feelings. If this is your conflict style, make sure you let yourself be an agent of your own actions, rather than simply serving the needs of those around you. Most importantly, let yourself say "no" rather than always being a yes-woman or man! Silent treatment: We've all experienced it and it's likely we've all done it to others too. Those who go turtle during conflicts (retreating to the silent comfort of their shell) tend to do so because they don't feel like they have the power to express themselves in conflict. The thought of articulating pain or anger can literally feel like another layer of pain to this person and, so, the more they're prodded into conflict, the further they retreat. However, it can be hard for a person to understand why you're upset if you're not communicating with them! The upside of the turtle's approach is that (unlike the scrapper), they're unlikely to say something they'll later regret. The downside is that they may never be able to express what they really feel. If you're in a conflict with a turtle and really want to encourage constructive conversation, avoid airing conflicts in public. Take a time-out and approach them when you're calmer and in a safe place. If you yourself are a turtle, think about ways you can better arm yourself for conflict, perhaps by writing things down in advance, and even practicing a tough conversation with a friend first. Just as we sometimes express affection differently (some people are more tactile, some more verbally expressive, others prefer to let their gestures speak), so there's a range of ways people express anger, frustration and hurt. Perhaps this flip side is even more complex than expressing affection, because more than happiness, anger tends to impede our ability to express ourselves. Of course, most of us inhabit a combination of these styles and that in itself can be frustrating. I can definitely think of times when I fell into each category -- largely tied to the nature of the relationship, the role I'm playing and the person I'm communicating with. Professional conflicts can bring out a different fighting style than friendships, families or romantic partners. But the key to a "good" conflict, is honesty and understanding, being empathic even when you yourself are hurt and angry. The more self-awareness we can bring to conflicts, and the more we try to understand where others are coming from, the more we'll get to the heart of the matter, learn something new, see from a different perspective and, ultimately, grow as individuals.